Our ring riser mylar holder trophies allow for incorporation of a Cub Scout Pinewood Derby disk, select one of our designs or submit a custom design request to recognize your Pack. Custom sizing, column and alternate figures are available upon request. Engraving is included on all trophies. Set of 3 Pinewood Derby Trophies - 12", 14" and 16" Trophy with Column Mylar Holder, Pinewood Derby Insert, Rectangle and Round Column, and Pinewood Derby Car Figure on a Black Marble Base with Plate. Save $1.00 per Trophy by ordering in a set. Select a Mylar and Trim Package for each set. 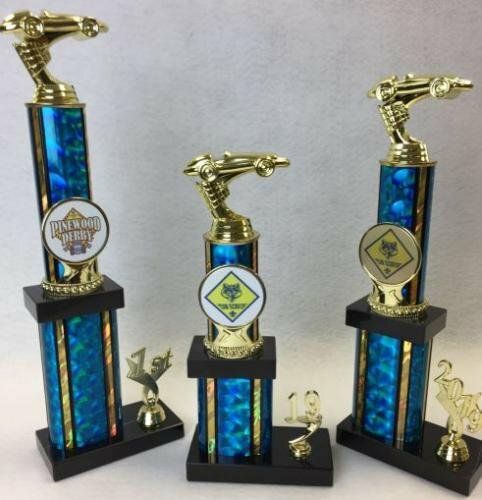 Set of three Pinewood Derby Trophies - 12", 14" and 16"